To create a new view, right-click the Views node under the connection node in Server Explorer. From the node's context menu, choose the Create View command. This command opens the SQL Editor. 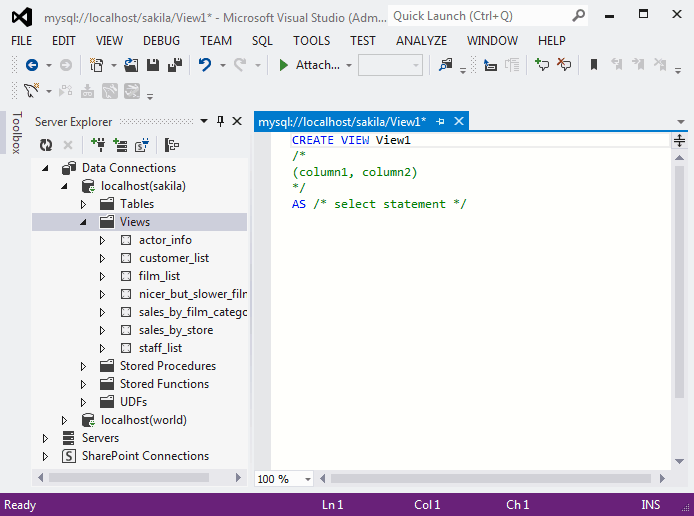 You can then enter the SQL for your view, and then execute the statement. To modify an existing view, double-click a node of the view to modify, or right-click this node and choose the Alter View command from a context menu. Either of the commands opens the SQL Editor. Check Option: Whether or not the WITH CHECK OPTION clause is present. For additional information, see The View WITH CHECK OPTION Clause. Definer: Creator of the object. Definition: Definition of the view. Is Updatable: Whether or not the view is Updatable. For additional information, see Updatable and Insertable Views. Name: The name of the view. Schema: The schema which owns the view. Security Type: The SQL SECURITY value. For additional information, see Stored Object Access Control. Some of these properties can have arbitrary text values, others accept values from a predefined set. In the latter case, set the desired value with an embedded combobox. The properties Is Updatable and Schema are read-only. 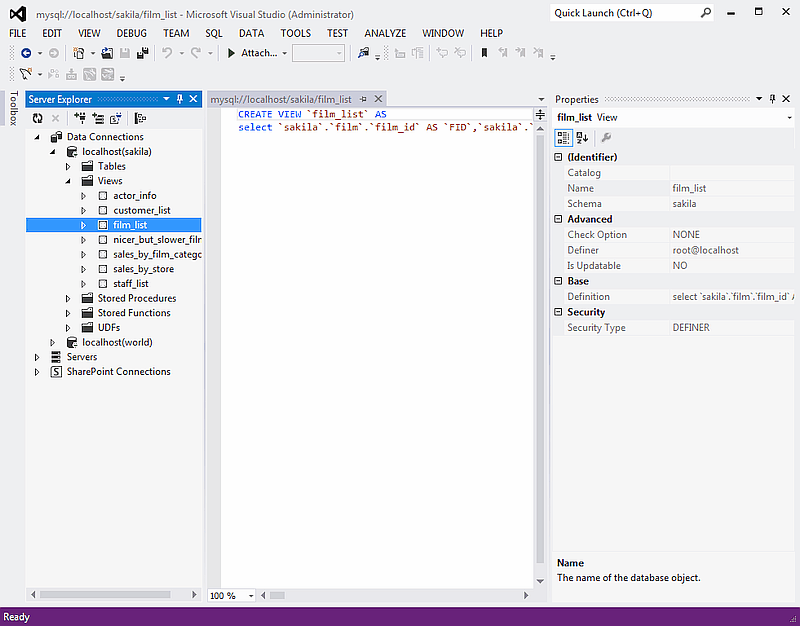 To save changes you have made, use either Save or Save All buttons of the Visual Studio main toolbar, or press Control + S.